FBTBForums.net :: View topic - Show your collection! With the exception of the Santa Fe Super Chief and its cars, I have maybe... 5 sets put together? Everything else is either a MOC or a box of parts. 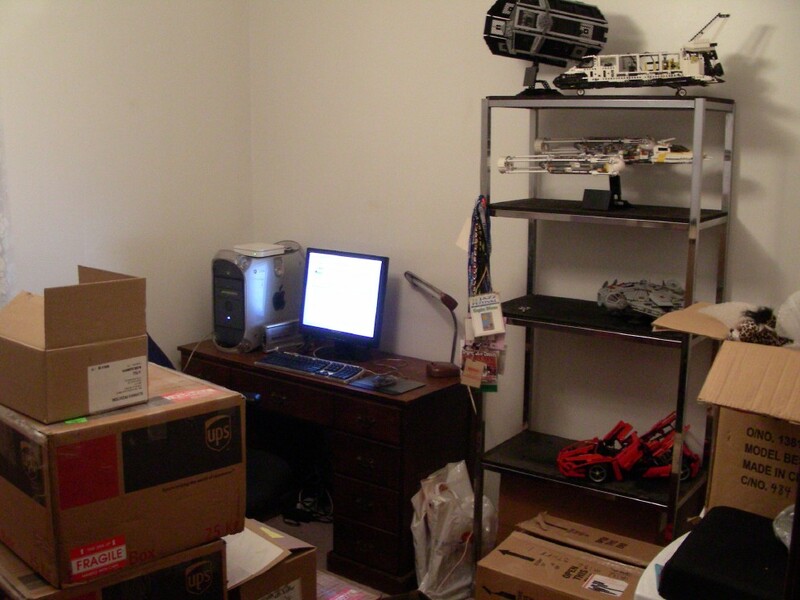 And most everything I've built is currently in boxes, which isn't very fun to look at. Ulmaris castle, if I were to take a picture of it right now, would be 2 50 gallon plastic containers, 1 2 foot cardboard cube, and 3 boxes that once held printer paper. Warnung! Diese Unterschrift ist Staatseigentum! Before you chime in with how old this thread is. 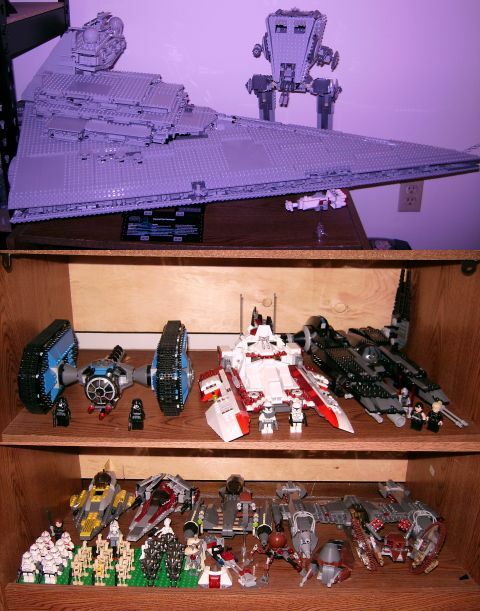 So come on post up your LEGO SW or non SW collection for all to see. You have a very nice collection. But how did you manage to keep them unopened? Violations of any of these can lead to your post being deleted and punishment by catapult. My wife and I live in a two bedroom apartment so I don't have any display room. I have posted in this thread, already, but my collection has grown since then. As I said, I don't keep sets together very long, but I do try and keep the boxes around. I did some organization a few days ago, and so here are all the boxes being taken out, and then placed back in in a slightly more orderly fashion. Yay! I managed to unpack some Lego yesterday. Nowhere to build yet though. Thejudeabides, you have a nice collection! But I think you're getting bricklink confused with brickshelf. Here are the eight display cases in my Living Room. I need to update the pics as I have filled out several of the shelves since these were taken a few months ago. 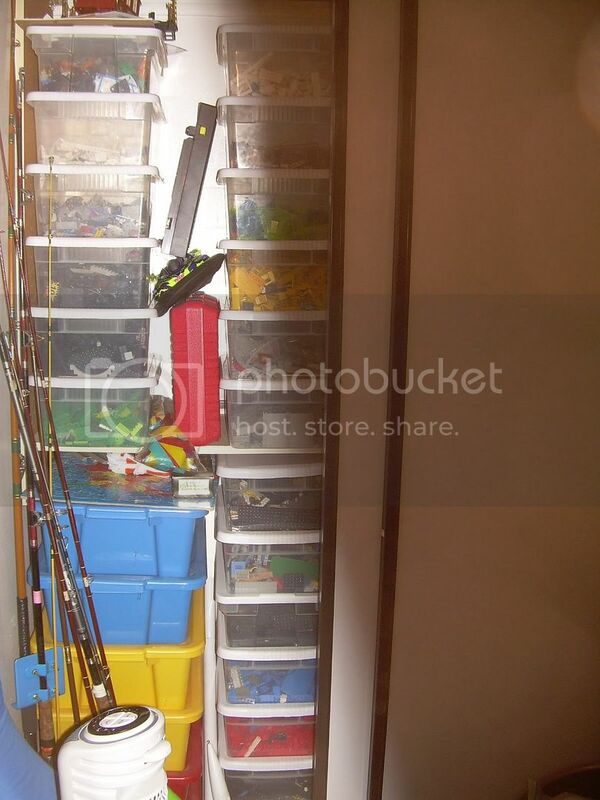 I also have a 4 by 8 closet/room in my master bedroom for everything that isn't currently assembled. In addition to shelves I have a table & chair in there for sorting, assembly etc. There is a 9th display case in my bedroom where I have a few more sets. In all only about 1/2 of my collection is displayed. Currently I am missing less that 20 sets to have a complete collection! 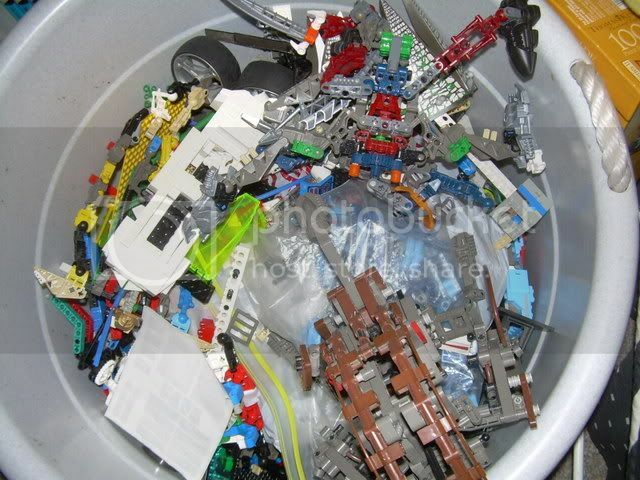 I do have multiples of several sets (bought for parts), some ExoForce and other misc sets also purchased for parts or building ideas. Collection wise my main interest is Star Wars. I do have the Sculpture Aircraft (1903 Wright Flyer, Red Baron Tri-plane & Sopwith Camel) and most of the Launch Command line. Well, I've gotten several sets since my last post, so I decided to take some new pics. I actually took one of each shelf, and concatinated them together in paint. My custom Colonial Viper is not shown. You can also see my totally awesome lamp and guitar hanging on the wall as well as a bookshelf with some of my Civil War things on display. The best flickr ever. I kid you not. I didn't think there was any harm resurrecting this topic. 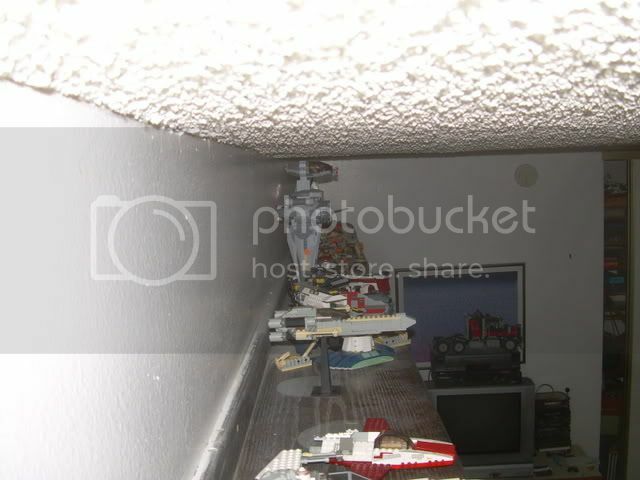 I honestly thought I had uploaded all of this pictures to Brickshelf at 800x600 pixels, but they are much larger in reality. So instead of deeplinks, you just get links. I have assembled my Clone Wars (waiting till after Christmas for the photography), Episode VI (the table seen is curently a wrapping station), MINI (table again) and UCS sets (again, waiting for Christmas). I'll edit this post when all photos have been taken. You'll notice in the Episode II photo that I included a MOC (someone else's design) in with the official models. I will do the same with the MINIs, when I get around to building them. If anyone is interested, all other themes can be seen in this folder. The most recent shot of my collection can be found here but it doesn't include everything and none of my displayed sets/MOCs are displayed in the shot. As you can see, there are still several glaring holes in my collection like the Millenium Falcon, A-Wing, Tie-Fighter, Vader's Tie, and Lambda Class Shuttle. However, I'm hopeful that I should be able to fill some of those holes this year witht he release of the new sets. It is really interesting to see how collections change over the year(s). 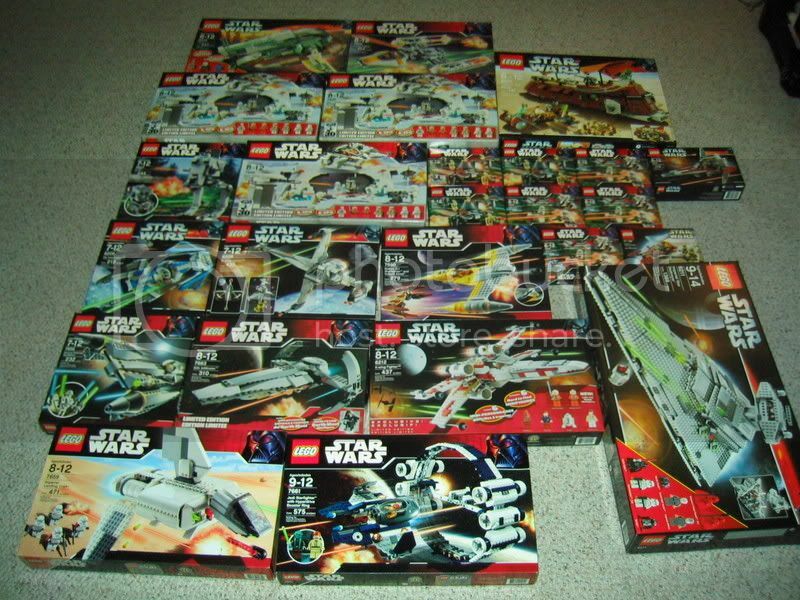 I made a big decision this year: I only collect Star Wars Lego, nothing else anymore. It just makes no sense regarding that I sold all my childhood Lego which included a lot of Castle stuff and other themes and I don't have the display space anyway. In June my Star Wars OT collection was pretty much complete, which you can see here. But because of display space problems I sold a few of the sets which I didn't love so much again. Right now I have the Millennium Falcon, Escape Pod, UCS X-Wing, AT-AT, Imperial Inspection, old A-Wing, new B-Wing, ISD, Mini-ISD, Ewok Attack, Speederbikes, old AT-ST, T-16 Skyhopper, X-wing with Yoda's hut, mix between the old and the new Y-Wing, Snowspeeder, Landspeeder, Jabba's Message and Final Duel 1+2. The only new things I have added to it is the hailfire droid and spider droid. Oh and I have replaced my old brickshelf folder with a new one you can view this Here You will also find that I have set up some folders in the star wars section that name some of the creations I will be making early January. I realise this is majhost and here is why: Brickshelf is the only image hosting site that works through my schools computers. So its mostly for school stuff. Majhost however was blocked off a while ago.